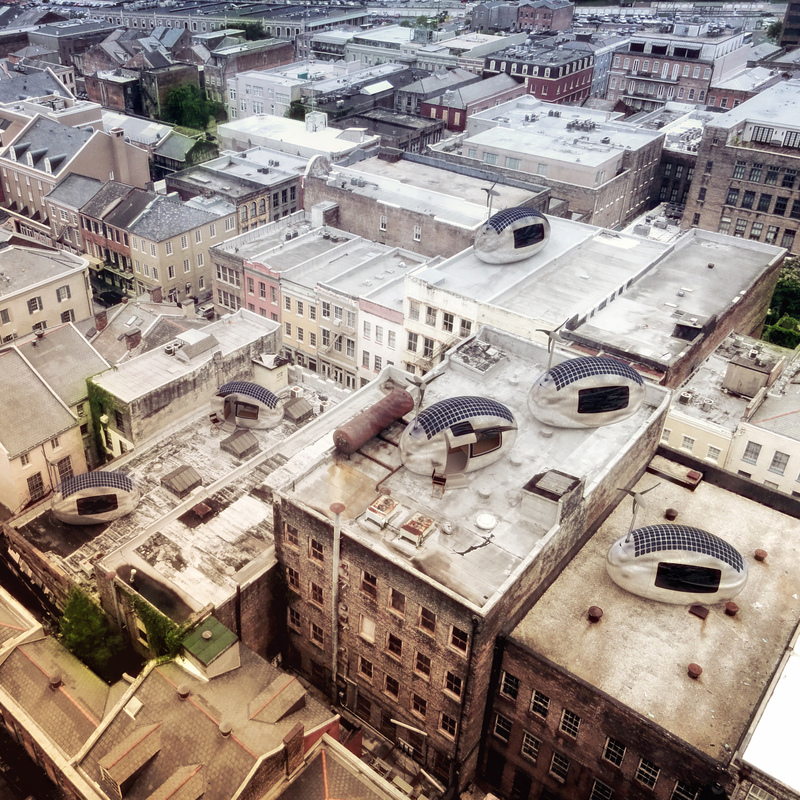 According to a survey conducted by Trulia, more than 43 percent of Americans want to live in bigger homes. According to common sense, every single one of them would love to do that without actually paying for a bigger home. Are you in that same wishful-thinking boat? Well then we encourage you to steal these brilliant space-saving tips and storage tricks from some of the biggest tiny homes we've ever seen. Think of this article as a gateway to exploring new solutions to your small apartment's age-old problem of sparse space. Here to remind you of that is the solar and wind-powered Ecocapsule that you can use to sneak on someone else's roof and live in -- without paying rent or utility bills. This 86-square-foot tiny home has everything you need to live comfortably in a small space. There's a kitchenette with two burners and a sink, a folding bed, a bathroom with a shower and a toilet that composts your waste, a water filtration system, a slew of storage compartments, and a counter where you can do anything but the work that drove you off the grid in the first place. 2. What goes up, stays up. Until you decide to take it down. 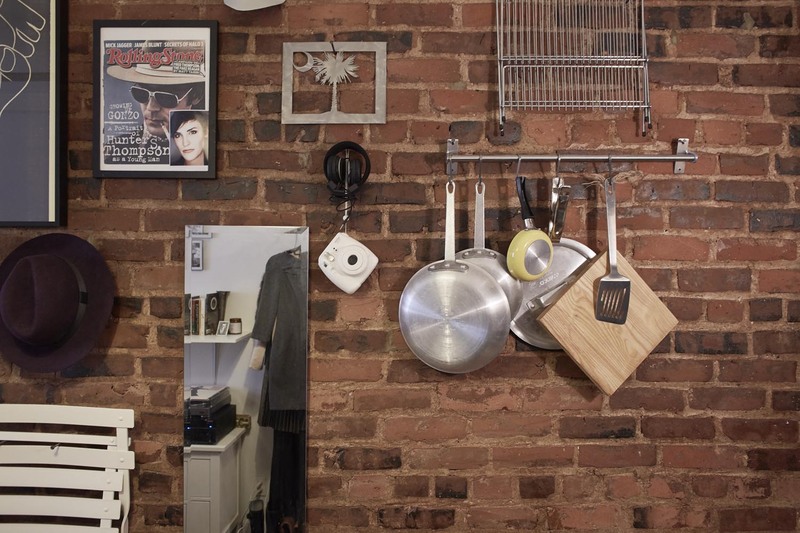 Mary Helen Rowell's 90-square-foot tiny home in the West Village shows that when it comes to figuring out how to increase your apartment's space on a tight budget, sometimes the answer is staring right at you. 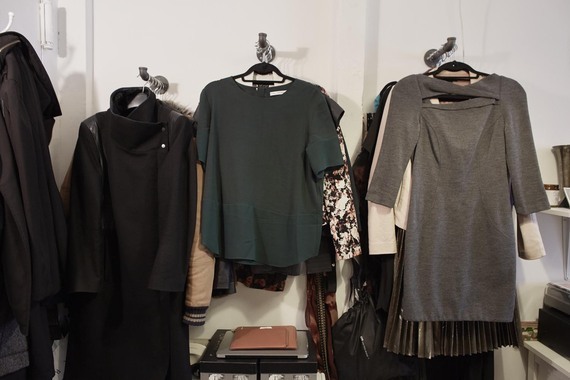 Attach some hooks to a wall and hang everything from hats, cooking supplies, and a foldable bistro table and chairs, to headphones, handbags, and your jaw that dropped to the ground because of all the precious floor and counter space you just saved. You can save even more space by hanging your shirts with their fronts facing you. "These are what we call faceouts," said Mary Helen while showing them to Fox News, a tip she picked up from working in fashion. "Usually, clothes are done sort of shoulder out. But as you can see, this takes up over a foot of space. Whereas these [faceouts] are only eight inches, so I'm saving a good four inches." A good four inches that you can save in your home too. Like with playing poker and eating pizza, folding is sometimes your best bet. Take the Resource Furniture wall bed from Graham Hill's 420-square-foot tiny home in SoHo for example. When Graham isn't sleeping, he folds his bed into the wall. All that's left is a shelf and a comfortable sofa with "Netflix and chill" written all over it. 4. Make your furniture work overtime. We're all workaholics, so why shouldn't our furniture work as much overtime as we do? What Alli Sosna's 350-square-foot tiny home in the East Village lacks in square feet, Alli makes up for with smart space-saving tips. She hosts dinner parties on an eight-person table that shrinks into a one-person desk. Don't stop at transforming your table though. 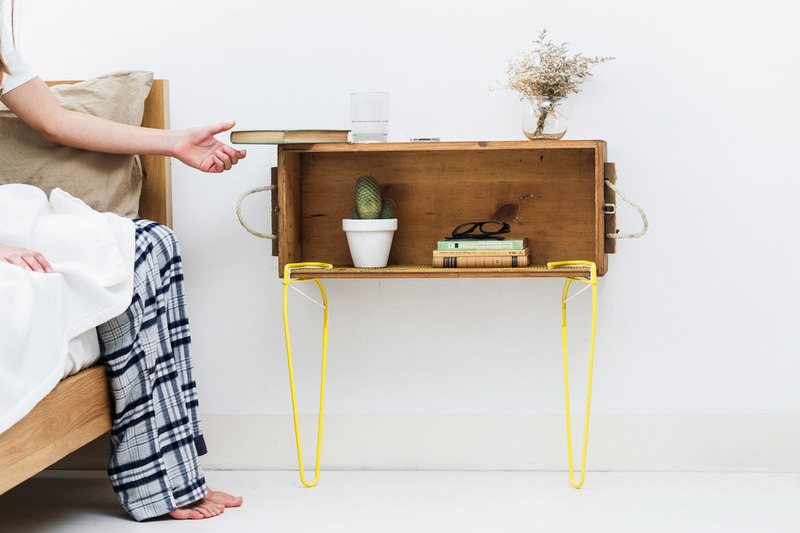 Morph your window into a gorgeous balcony with the help of Bloomframe, and make a nightstand/bookcase in seconds by clamping two SNAPs onto a drawer. 5. Hide and seek new heights. Hiding bodies of clothes, shoes, bags, and cash is tough unless you know a guy who knows a guy. Turns out, designer/entrepreneur Simon Woodroffe is your guy. Your guy who designed a 430-square-foot tiny home called YO! 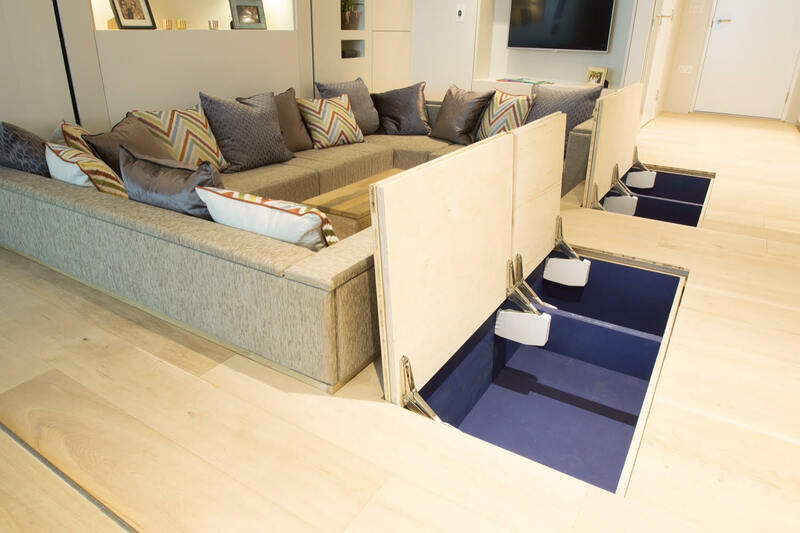 Home that hides mini storage units inside its floor. For giggles, YO! Home plays Peekaboo with its dining table, benches, and kitchen. YO! Home is quite the happy home. How do we know? Its bed celebrates all of its storage and space-saving accomplishments by jumping with joy. Because innovation breeds success, and success feels ridiculously roomy, tear a page out of YO! 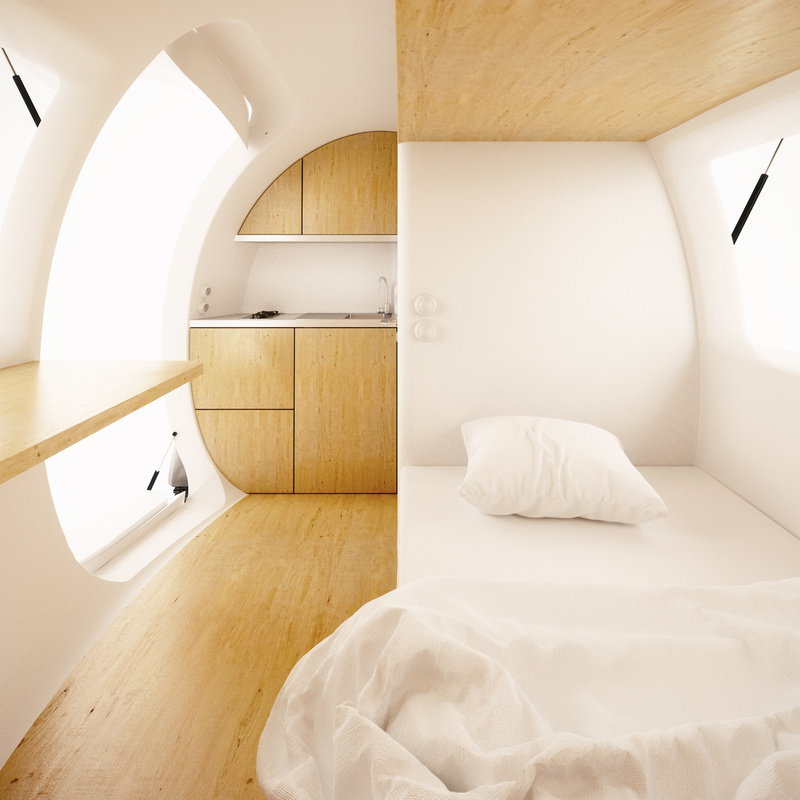 Home's book and go where none of your friends' apartments have gone before: underground and midair. Besides calling a breathtaking city "home," what makes Christian Schallert's 258-square-foot tiny home in Barcelona so game-changing? The fact that it's pretty much an empty rectangular prism. Until you treat its cabinet doors like LEGOs and press them to reveal a new world full of endless possibilities. Endless possibilities that you can easily create for your apartment by installing spring-loaded doors onto your cabinets, storage ottoman, and any other hollow object. 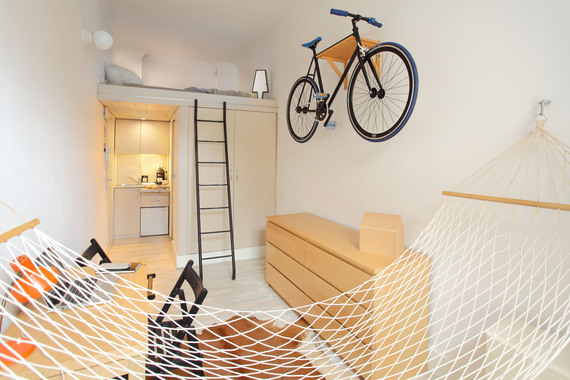 Afterwards, pull your bed out from underneath your tiny balcony and sleep like a baby from all of your hard DIY storage hack work. In addition to a makeshift bedroom for your roommate, dividing your apartment with a partition creates new, legal opportunities. 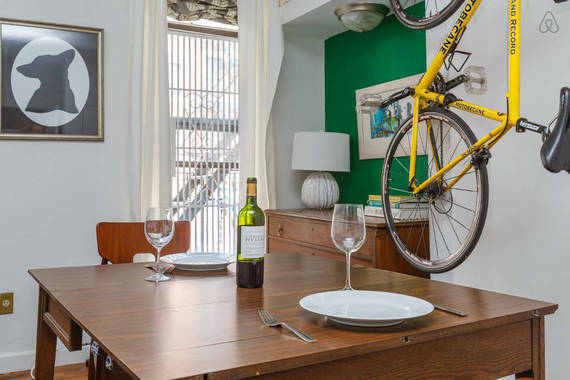 Something as simple as a room divider, a DIY wood pallet barn door, or the sliding storage wall from this 390-square-foot tiny home in Gramercy Park, is all you need to conquer every private activity you've put off because your roommate won't leave. Who needs to buy a bigger home when you can create as many rooms as you want in mere seconds? 8. Fake it 'til you make it. Does your apartment feel stuffy? Cure it by pretending you're Criss Angel and perform optical illusions, except with lighting instead of death-defying stunts. 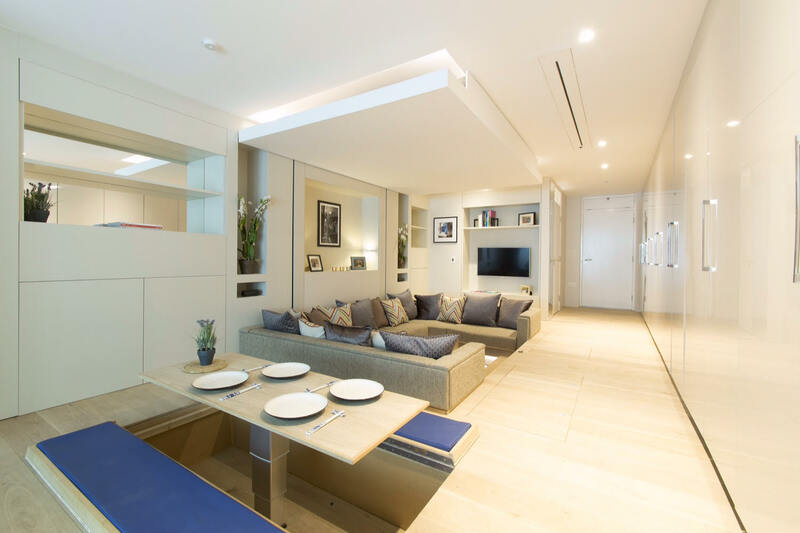 A huge and bare balcony sliding glass door floods the subway-car-size home with natural sunlight that tricks your mind into thinking the place is bigger than it actually is. Light-colored walls reflect that light, which further expands the space. All of this happens while track lighting and recessed lighting highlight various spots to add character. Character that feels alive and palatial. 9. Bring the gym to you. "I don't have time to go to the gym, let alone the space to work out at home," said the traveler who's never heard of Zoku, a hotel of tiny homes for digital nomads. In addition to tons of secret storage space, an alcove desk, and stairs and a wardrobe closet that both eject from the wall, Zoku features one of the most effective pieces of fitness equipment to ever exist: zero-floor-space-hogging gymnastic rings. Pick up wood gymnastic rings (wood rings are less slippier than plastic rings and age better when properly maintained) from a place like Rogue Fitness, secure them onto a bar or mounted hooks, and get Hulk-jacked as you follow the Super Human Gymnastics Ring Strength workout. 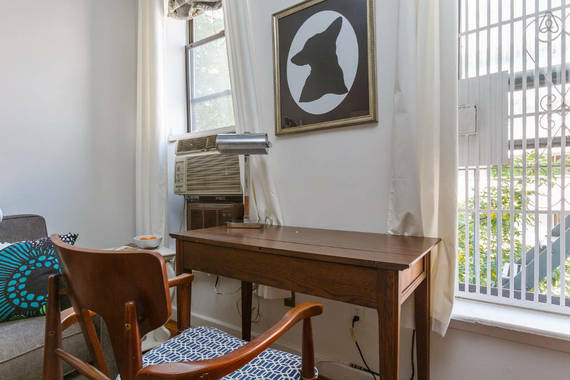 If you rent an apartment and want your security deposit back, you shouldn't perform surgery on it with some of the above space-saving tips and storage tricks. Instead, inject space into it without leaving any scars. Minimalist Szymon Hanczar's 140-square-foot tiny home in Wroclaw, Poland teaches you to downsize your belongings. Only keep things that you absolutely need and/or make you happy. Donate, gift, recycle, throw out, or store the rest. Afterall, less stuff is more space, and more space is more freedom.